Enhance Ingredients: Talc, Mica, Dimethicone, Octyldodecyl Stearoyl Stearate, Zinc Stearate, Zea Mays (Corn) Starch, Silica, Pentaerythrityl Tetraisostearate, Potassium Sorbate, Chlorphenesin, Tetrasodium Edta, Tin Oxide, Titanium Dioxide (Ci 77891), Iron Oxides (Ci 77491, Ci 77492, Ci 77499). 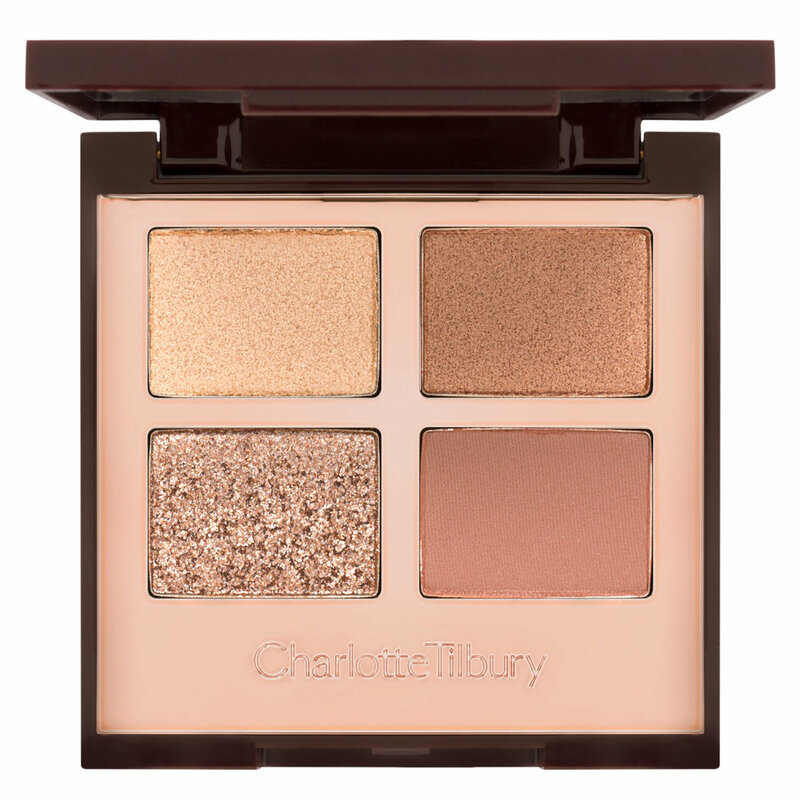 Create the illusion of bigger, brighter eyes with this four-shade eye shadow palette from Charlotte Tilbury. Inspired by the eye-opening effect of social media filters, Bigger Brighter Eyes enhances the shape, color, and sparkle of your eyes with specially curated colors and textures. Apply the Prime shade all over your eyelid and into inner corners with a blending brush. Apply the Enlarge shade to the socket for a lifted look. Add instant definition by sweeping the Define shade along your lash line to create the illusion of brighter eyes. Pat the contrasting Pop shade on the eyelid to make your natural eye color pop. I loooove this palette! It's compact enough to travel with and you can create many looks! I've become tired of traveling with my huge Mary Poppins of a makeup bag. So I began looking for a palette that is small enough to travel with while accomplishing a every day look (the "Natural" makeup look) as well as a soft smokey eye. I'm so happy I came across this palette. I have been able to accomplish many looks with this. I can use all 4 colors, or just the sheer sparkle topper (bottom left). The sheer sparkle topper has glitter in it but it's so finely milled, that it's not difficult to pick up the product and apply to the lids. However, I find it a bit easier to apply the sparkle topper using my finger tips and dabbing it onto the lid. I did not see the shadows crease or fade throughout the day. I did see my eyes appeared bigger and more awake. Whenever I wear this, I have so many people asking me what I'm wearing on my lids! I highly recommend! The colors are soft and super flattering. Pigment doesn't seem great initially but works really well on the eyes. It's perfect for a natural everyday look. Blends beautifully, really like it! This palette is beautiful and so is the packaging but it wasn't what I was expecting. After seeing promo pictures I thought it was going to be the perfect everyday palette for me but it was not. It made my eyes look dark and made my dark circles stand out more and I thought the colors were going to be more pigmented and the pop shade more popping and it wasn't. I already send mine back! !